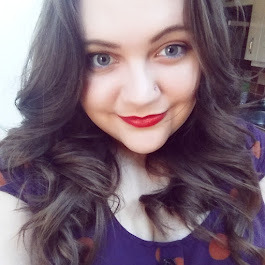 So, I am currently pretty much bed bound with some horrible flu like bug hence the lack of beauty posts, but when you feel like poop there are some things that just lift you and make you feel that bit better. With me, it's lighting a few beautifully scented candles, snuggling down under a blanket and watching a film or reading a book. There's something so therapeutic about the soft glow of candles and I am totally hooked. 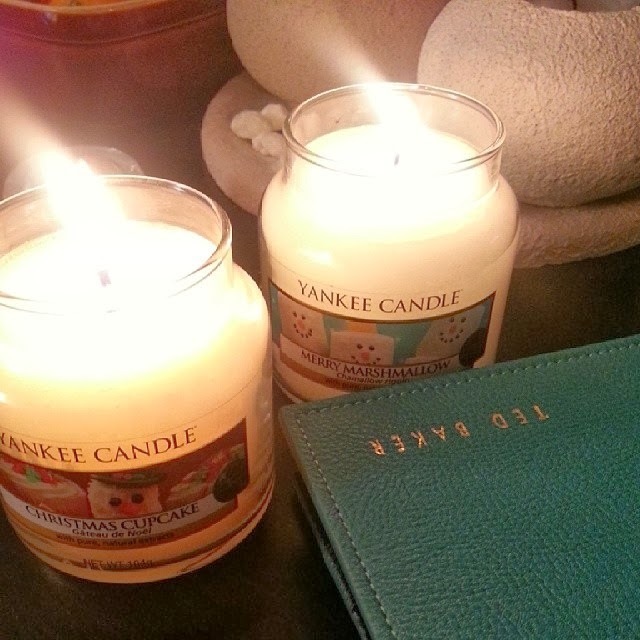 My favourite scents have always been the sweeter, foody smells like the Christmas Cupcake and Merry Marshmallow offerings above. Although, until recently I stuck to offerings from the likes of Ikea and Primark which gave off very little scent. 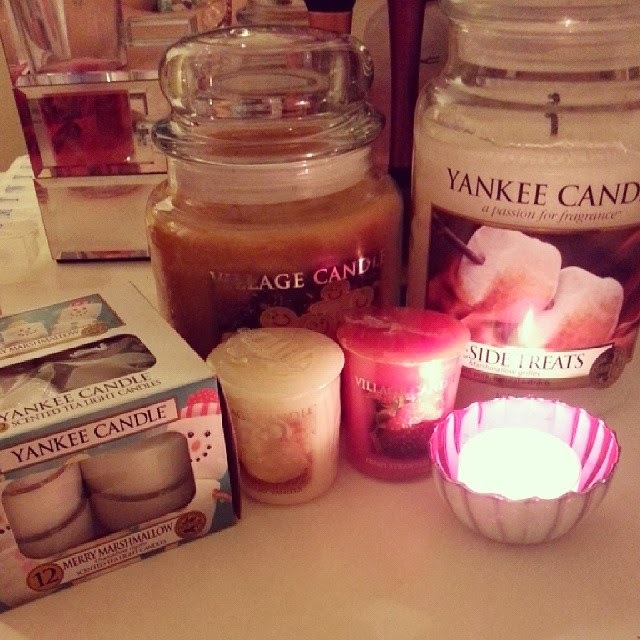 However, I am now a Yankee Candle convert. I picked up a large jar of Fireside Treats when I was recovering from my tonsillectomy and the long burn time and the strong, room filling delicious scent was enough to leave me wanting more. Since then I've picked up quite a few others, including Butter Cream, Whoopie Pie, Gingerbread Cookie, and my very favourite; Christmas Cookie. 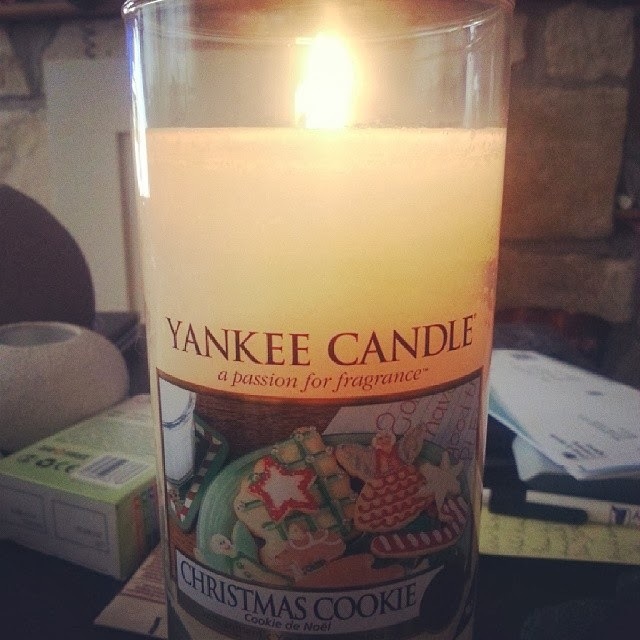 I am so in love with the scent of Christmas Cookie! Described by Yankee as smelling like "buttery rich, vanilla scented holiday cookies" I'd say that it's pretty much true to its word although the reason I rank it above other cookie scents from Yankee is that it doesn't have that weird, artificial biscuit smell that some do, its just pure vanilla, buttery goodness. At the moment I'm also eagerly awaiting White Chocolate Bunnies from the Spring collection, a Candy Cane Cottage swirl and a Moon Pie swirl so I'm pretty excited.